12VPN is a service that you may not have heard of but in certain circles it’s well known for its ability to fly under the radar and enable access in countries where using the internet freely is otherwise difficult. While they may not be a name you see regularly they have a loyal following of users who rely on their service to keep their connection secure and keep information flowing freely. We wanted to know more about this limelight-shy but highly rated VPN service so sat down to ask them some questions. VPNCompare: Who are 12VPN and when were you established? 12VPN: We’re a group of (former) expats and travellers who founded 12VPN in 2009. Initially for our own personal use, to escape arbitrary restrictions and improve our security while on the road. VPNCompare: 12VPN is relatively unheard of by the public but well-known in specific circles, is this a conscious decision? 12VPN: We received a lot of media attention very early on. That was great for sales, but not so great for being able to stay true to our mission. It made us a target in several crack-downs that followed. We decline most press requests since. VPNCompare: Your service has become known as one of the best to unblock in restrictive regions, why do you feel this is? 12VPN: The needs of our clients, as well as ourselves, have kept us focused on unblocking. Facilitating bittorrent or Netflix/Hulu would probably be easier and more profitable, but ultimately not what we’re looking for. VPNCompare: The VPN market is already overcrowded, what do you feel you can offer that’s different from what’s already available? 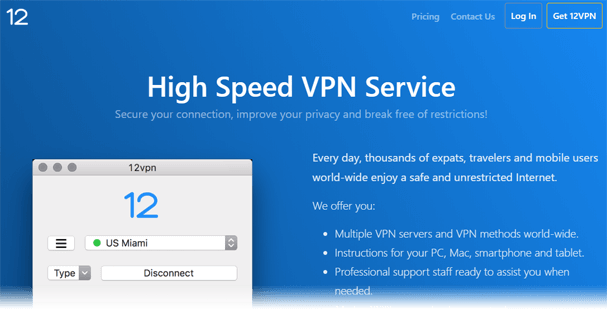 12VPN: 12VPN offers a combination of cutting edge technology and outstanding customer service from an established company. There are a lot of old tech, poor service and fly-by-night operations out there. Many won’t last. VPNCompare: With decentralised-VPN and other technologies emerging do you see a future in the traditional VPN? 12VPN: Eventually the traditional VPN will go back to where it came from: the corporate world. But it will take a while. There’s still a lot to be done to get performance and user-friendliness of decentralised solutions up to par. VPNCompare: Although VPN access can be hit and miss in some countries, do you think completely blocking VPN access is ever a game that can be won? 12VPN: With sufficient technical barriers and/or by penalising VPN users they could certainly destroy the market in those countries. For all practical purposes that would be a win. VPNCompare: With infighting and accusations between VPN companies commonplace how do you feel this effects the industry as a whole? 12VPN: Any rapidly growing market will attract bad actors. Fortunately there are plenty reputable VPN providers out there. Websites like yours can help people make an informed choice. VPNCompare: Where do you see the VPN industry and your organisation in the next five years? 12VPN: The market will have doubled and VPN’s will have shifted to highlighting their value added services. Differences between VPN’s will be more pronounced. VPNCompare: Thanks for your time 12VPN! 12VPN offers apps for Windows and Mac systems plus Shadowsocks and other manual VPN protocols for mobile devices running Android and iOS. There are also solutions for Linux and a selection of other devices. If you’re interested in taking a look at 12VPN you can visit their website.